aniela Dance Company was founded by Daniela in 2007. Comprised of talented dancers from a variety of training backgrounds, the Daniela Dance Company is a group of performers committed to providing quality Middle Eastern Dance/ Bellydance performances to the NYC Tri-State area. All of the dancers in the Daniela Dance Company are highly-trained professionals, with backgrounds in a variety of dance styles. 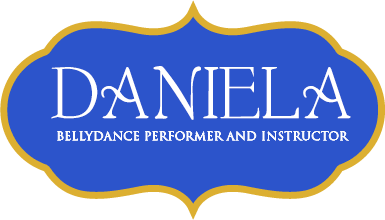 ​Daniela Dance Company members have danced at a wide variety of venues, including charity galas, cruises, restaurants, lounges, senior citizen centers, community events, weddings and private parties. Daniela Dance Company shows are highly entertaining, family-friendly performances. The perfect addition to any event! ​Daniela's broad dance background began with her first dance class at the age of 2. Her dance foundation came from her studies of tap, jazz and ballet as a child, adding hip hop to her repertoire in college. After college, Daniela discovered the art of Middle Eastern Dance. She began her studiess under the legendary Amira Mor from NY/NJ. While she was a dancer with the Amira Mor International Talent Company, Daniela was a featured dancer in two of Amira's instructional videos - Bellydance Your Way to Cardio and Bellydance Your Way to Ecstasy. Daniela has been teaching Bellydance to students of all ages and dance backgrounds for over fifteen years. She is the founder and director of the professional bellydance performance ensemble, the Daniela Dance Company, and the producer of an annual performance showcase, as well as several smaller shows throughout the year.